This view is looking down Chaveney Road from the Woodhouse Road direction towards Buddon Lane corner. 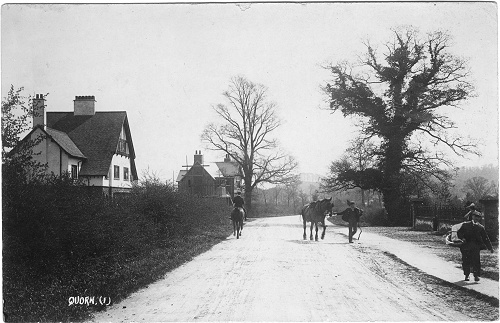 In the foreground (left) are what are now 65 and 67 Chaveney Road and at this time were called 'West Hayes'. They are easily recognisable today. In the background (centre left) is a house in the process of being built. This house was built in 1904 by Edwin Neal, and at that time was called Woodhouse Lodge. It is now 61 Chaveney Road and is almost opposite Buddon Lane. Dearest M, Just a line to let you know we arrived safely the other night. It was eleven o clock when I got in. We had to wait a long time at Barking. The train was very late. My Mistress did not expect me in before, so it was alright dear. Love to all from Maude. The Chaveney Road area saw a flurry of building activity in the early 1900's, prompted partly by the Great Central Railway connections. This scene looks very rural when compared to today, but interestingly, Chaveney Road now has far more trees and looks very wooded. The road is not made up, although there seems to be some sort of footpath on the right. On the far right is a tradesman (baker?) with his basket and behind him a workman with his spade, leading a horse. A lady is walking in the opposite direction and is just passing a large pair of ornate gates.